HIGH & LOW ENERGY DOOR SYSTEMS - WHAT MAKES THEM DIFFERENT? Low energy doors are often thought of as "handicap accessible automatic doorways". These doorways usually have signage showing the universal symbols that are understood as wheelchair accessible openings. In most installations, low energy door systems are either swinging or sliding doors. They are predominantly activated by a "knowing act" on the part of the doorway user. A button or push plate is used to activate the door operating mechanism. 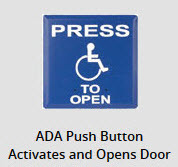 A person wishing to enter the doorway must push the button to start the door opening function. The low energy requirement of these doorways pertains to the forces exerted by the moving door through all aspects of the opening and closing cycle. Some of the low energy door systems are strictly power assisted door openers. In their most basic form, these doors use motor controls to push or pull open a door. After reaching the fully opened position a basic timer will keep the door open for a specific set time. This allows a person in a wheel chair access without having to push or pull open the door in front of their path of travel. When the timer has counted down, the door will close, and cannot be reactivated to reopen without another push of the button. Every low energy door system must operate slowly and with minimal force upon impact or resistance. A properly adjusted low energy doorway will stop, stall, or reverse when an obstruction is encountered during its operations. The more complex or sophisticated the low energy door control, the more potential features will be available. Some possible options include a power assisted feature that will sense the force exerted by a user and activate the door motor control to take over the opening effort. A feature called "Push and Go" is often available which performs this type of function. There are also obstruction reactive elements that will stop, reverse or recycle the opener that may be included in the motor control command options. According to specific industry wide safety standards, no optical sensor or proximity sensor of any kind is required on any low energy door system that is operated by a push of a button known as a "Knowing Act". For this reason, these types of doorways are practical for low volume traffic. They are safe when used appropriately and regularly tested for proper force and speed when moving. These doors can be problematic when installed in place of a more costly high energy, fully automated doorway. Daily inspections of all low energy door systems is an industry wide requirement. Most manufacturers provide signage and stickers that are positioned on door frames instructing the manager of any facility that the observation of these doorways is needed routinely. In an effort to improve the low energy products, retrofitted sensors and threshold protective devices used on fully automatic high energy door systems have been installed on low energy doors. This has become an industry wide practice that is acceptable. The sensors are often placed on these low energy openers to keep a "tailgating" pedestrian from being hit by a closing door that has "timed out" after the first user has passed through the doorway. When actual pedestrian traffic counts exceeds the original expectations of the architect or designer, it is a good idea to replace the low energy door system with a fully automatic high energy doorway. High energy door system s are available in many different configurations. Swingers, sliders, revolving, bi-parting, and telescoping are the most prevalent types in usage today. Their application and installation are dictated by design choices, weather requirements and location parameters. These doorways differ from low energy door systems in the way that the door operates and the force and speed that the doors possess when moving. In general, automatic door systems have an approach sensor, a threshold protection sensor and an egress sensor. The complexity of the automated door system dictates the level of sophistication of the entire door component control and sensor package. As discussed in many of my previous automatic door articles, specific requirements of different automatic door systems govern the types and locations of door sensors and safety devices. The one consistent requirement of every automatic door system is the need to perform daily safety inspections. Industry wide accepted standards have been adopted to help maintain the safety of all users of all pedestrian doorways. In the most general sense, no properly maintained and functioning automatic door should ever hit a user of that doorway. Industry standards stating the importance of daily safety checks and component inspections are normally positioned on warning labels provided by the product manufacture adjacent to the door control activation panels. The proper methods of determining the correct functions and operations of the doorway are listed along with test procedures and instructions to seek professional service assistance if any of the safety devices fail to work as described. There is usually a warning to discontinue the usage of the doorway until all safety features function consistently and properly. Because high energy doorways move at a much faster speed and force than low energy doorways when opening and closing, it is very important to know that all of the built in safety sensors are functioning properly at all times when the doorway is in use. Most standards are compiled from suggestions and the informed input from manufacturers, installers, architects, engineers, and door designers. The general public has the ability to suggest additions to these standards as well. When the standards are developed, written, and finally accepted, there is often a delay in instituting the new ideas until the next revision is printed and published. Products that are produced during an interim period between standard revision editions are considered compliant at the time of manufacturing. However, they may not always comply with the revised standards shortly after their production period. In most cases the previous standards are incorporated into the newer editions. The basic parameters and ideas behind the earlier version of the standards have been more refined or finely tuned, not generally changed from the original concept. With changes in technologies certain aspects of door controls, activation devices, door sensors, and safety equipment have made prior standards obsolete. An example of this is the current usage of overhead door sensing devices to control door functions. Originally, on the early automatic door systems, prior to the development of consistent and dependable sensors, floor mats with electric or hydraulic contacts were the most common form of door activation. Pressure sensitive mats are now in limited installations and considered outdated in most applications. There are generally provisions in the standards that refer to older equipment that has been in service and still functioning adequately. But, the emphasis on safety is always the primary basis for automatic door standards and the reason that improved designs and newer technology products have taken over. As the retained expert witness for both plaintiff and defense in hundreds of personal injury and wrongful death automatic door cases, I have seen severe injuries and deaths occur as a result of every type and design of malfunctioning door systems. In older automatic door installations, failure of the sensor floor mats often caused injuries. These older technology mats, and, in some cases, original system components were generally installed in grocery stores. They were most frequently associated with automatic swinging doors and were considered a great convenience to shoppers that no longer had to hold open the store doorways as they pushed their shopping cart in or out of the store. Some old door standards make reference to control mat usage in sliding door installations. In actual practice, multiple scanning sensors were typically installed in place of the pressure activated floor mats in those systems. Pressure sensitive control mats would ultimately deteriorate due to heavy shopping carts constantly running over them. Weather related issues such as exposure to ultraviolet rays from the sun, or effects from freezing rain, snow, and ice, would cause the mats to become brittle, have contact problems, and fall apart. Pedestrians using these doorways would become confused as the mats failed to consistently signal the door operator. The doors would either fail to open, fail to remain open, or react erratically when stepped upon. With more modern technology and the usage of scanning sensors, the zones of coverage and potential for increased safety of the pedestrian using the automatic doorway is greatly improved. Some new automatic doorways have integrated safety features that will deactivate the door operator. This integrated safety feature can render the doorway harmless to any user when these new state of the art sensors are malfunctioning or improperly positioned. Even so, the majority of doorways that are currently in use must be inspected daily to insure that the sensors and motor controls are operating safely prior to the start of business every day. I have authored and published many articles about maintaining automatic door systems. In those articles I have referred to numerous past cases where injuries resulted from a variety of deferred conditions or a complete lack of inspection and/or maintenance. 1. A woman entering a small convenience store was hit by an outward swinging automatic door when another patron approached the interior side of the doorway to leave the store. In some installations, two-way traffic is possible with one door opening. In other installations, a door to enter and a door to exit is provided. Due to the fact that a single doorway was in place to allow both ingress and egress, the door system had to have safety devices in place to guard against this type of circumstance. Upon my inspection, I determined that the overhead sensor on the exterior of the doorway was not sending information to the door motor controller which would have kept the door from opening outward when the patron on the interior of the opening was attempting to exit the building. For this reason, a two way door system that swings has often been replaced with a sliding or bi fold doorway to eliminate the possibility of collision or entrapment. The subject door I inspected was not compliant with the industry standards for operation, and had not been tested or professionally inspected for several years prior to the incident. 2. A woman was entering a department store when an automatic swinging door struck her from behind, slicing her ankle. When struck by the jagged door edge, her Achilles tendon was cut and she immediately fell to the ground in the middle of the doorway. After viewing the store video footage that captured the incident, reviewing the service records provided, and from personally testing and inspecting the doorway during an on-site visit, it was apparent that the door moved far too quickly. The sensors were improperly adjusted and there had not been any in-house inspection of the doorway as required. 3. A small boy and girl were walking ahead of their father through an automatic sliding doorway at a local home center store. The children were about to cross the threshold when the door suddenly closed upon one of them. The second child saw the door move and grabbed his sister as the door slammed upon her. The boy broke his hand, and the girl sustained a broken leg. The father quickly scooped up the two children, and was also struck by the out of control sliding door injuring his shoulder. The incident was captured on a video recording that was "lost" during discovery. In case #1 it was discovered during a deposition that the store owner had not wanted to pay for professional service repairs. He enlisted the help of his son to disable partial function of the outside door sensor. Altering the function of the outside sensor allowed the approach portion of the exterior sensor to function while stopping the sentinel portion. The sentinel protection was designed to disable the door motor control when someone is occupying the outswing path of the door. That tampering with the sensor created the possibility of hitting pedestrians in the path of the door swing. The store owner claimed that he could not afford to repair the defective sensor, so he made do with what he had. His son was going to school for electrical engineering at a local school, and he knew how to make the door work without spending any money. By altering the function of the doorway sensor system, the store owner was found responsible for the injury. He was also found negligent in his store maintenance and daily operations. In case #2 the store ownership believed that the woman using the door was responsible for her own injuries. According to the store manager, she had slowed down as she was entering the store or had actually stopped in the threshold while entering the store doorway. The store management claimed in depositions that daily inspections were made by their security guards. The security guards contradicted the management's position stating that they turned on the power to the doorway, but never really checked the function when they opened the store each morning. Observation of the store during subsequent months proved that no daily inspections were ever made by the store security or any other employees. When the doorway was inspected, it was determined that the motor controller had been damaged during a prior power surge, and the erratic operation of the door was confirmed. In case #3, the store intentionally disposed of the video taken during the event. Any good attorney will issue a notice to preserve all evidence including video recordings from the time of an incident. Upon inspection, the doors operated as described by the father. It was determined that two cross threshold sensors had been disabled. The two children were not "seen" by the upper sensors as this older automatic sliding door relied upon electric eye type of beams to guard the threshold during operation. The store was penalized by the court for tampering with evidence, and was sanctioned. The store was found responsible for negligent operations and practices. Automatic door systems are complex and can be potentially dangerous pieces of equipment. In deferred condition, automatic doors can exhibit significant forces that can lead to life threatening injuries. In the above three examples, all of the injured parties recovered fully. Many injured in automatic doorways are not so lucky. Every year there are many wrongful deaths associated with malfunctioning automatic doors. But that does not mean that a properly functioning and correctly adjusted automatic doorway is not safe. AUTOMATIC DOOR MANUFACTURERS - Are their products safe? The manufacturers of most automatic door systems provide products that are safe and time tested. Most of the products commercially available have been thoroughly inspected, lab tested, and put in to production after careful design and usage parameters have been met. In almost every case where I have been retained as the door and hardware expert, the defects found in the door systems have arisen from improper maintenance, a lack of policies, plans and procedures that the store management fails to observe, and an attempt to save the cost of hiring a professional competent service provider. As a pedestrian using these ubiquitous doorways, be aware of the doors that you are passing through. Observe the operation of any doorway prior to entering, and proceed with caution as you pass through the threshold. Diligence on the part of any automatic door user will help to assure safe passage. Be sure to report any defective operation to a store manager, and avoid distractions when entering an automatic doorway of any kind. Always pay attention as you walk through any doorway.